Our check in system provides an independent visitor queuing system that effectively documents and sorts the traffic flow in your building. This simple kiosk ia able to handle 12 departments and 12 reasons per department. It is a low cost system to help provide services to your veterans quicker. It also gives you the documentation to establish staff lines and productivity needs. VA Check In is the latest improvement to customer service. Using an Apple iPad you can now collect and distribute arriving visitors information across your network to your staff computers. Departments can sift through to find exactly who is waiting and what they need. 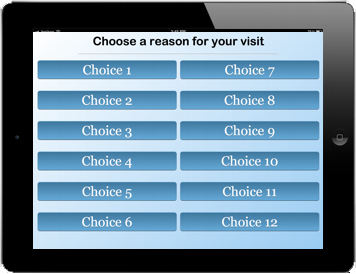 Touch screen devices have brought advanced technology to a simple process. Paper sign in sheets have to near a receptionist, read by an individual and the information is only usable by that one person. To make it worse, the information is often unreadable and has to be stored for years. When you want to recall something from the paper it could take hours or even days to find what you need. Cheap...yes, efficient...no. 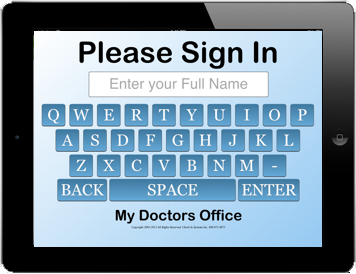 Electronic sign in sheets solve all these issues. Staff can look up the last person to help the veteran and when their last visit was. This would allow follow up visits to flow better. You can also lookup how many times a particular veteran has visited.